Oyster Worldwide is delighted to send volunteers from around the world to South Africa to volunteer with sharks and other marine life. The project is located in what is known as the Great White Shark Capital of the world – although tragically its marine environment is under severe threat. This volunteer project aims to protect the marine life in the region, from sharks to whales from penguins to dolphins. Volunteers join a local eco-tourism organisation, dedicated to conserving and preserving this delicate ecosystem. Why are there so many sharks here? This project is located in a critically important ecosystem. About 600,000 Cape fur seals are resident in the bay, and they attract the densest population of Great white sharks in the world. Are there other animals in the area? 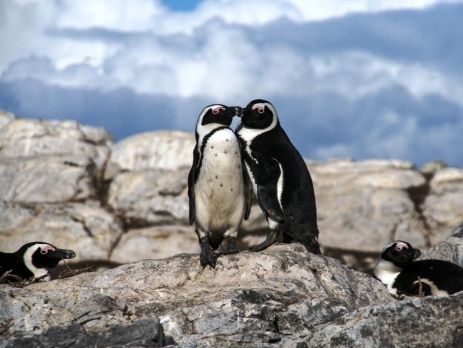 The bay is home to breeding colonies of the endangered African penguin, Bank cormorant and Roseate tern, as well as thousands of other seabirds. Humpback whales, dolphins, Orcas and Bryde’s whales can often be seen off shore too. 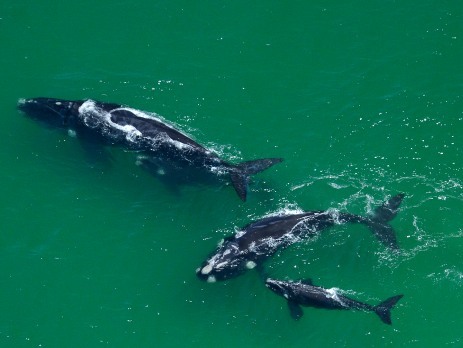 Additionally, Southern right whales migrate here from Antarctica to feed, mate and calve between July and December each year. What are the issues facing this marine ecosystem? Penguins: The African penguin population has declined by a shocking 98% since 1920 – and is still decreasing by about 90 birds per week. Because of this, it is predicted that they could be extinct by 2030, which has led to the African penguin being declared as “endangered” by the Union for Conservation of Nature. The causes of this rapid population decline are varied. In the past, penguin colonies created 4 – 6 cm thick layers of guano (penguin poo) on top of the rocks. This layer allowed the penguins to create burrows to shelter and reproduce in. In the 19th and 20th centuries it was found that guano could be used as a cheap and accessible source of organic fertiliser, and so it was scraped from the rocks, leaving the penguins to nest on exposed rocks with no protection for eggs or chicks. Additionally, penguins are highly susceptible to marine pollution, such as oil. If penguins get oil on their feathers, even just from small spills on passing ships, they cannot swim and will either drown or be unable to go in the sea to feed. Overfishing has also meant that there are fewer sardines and anchovies for adult penguins to eat, meaning that they have to migrate further afield to feed. This extra distance brings them more vulnerability, as they are heading further from safety and expending more energy to get there. They are often predated by Cape fur seals. Sharks: The numbers of Great White Sharks are dwindling, but there is simply not enough research and knowledge about these creatures to be able to better protect them. 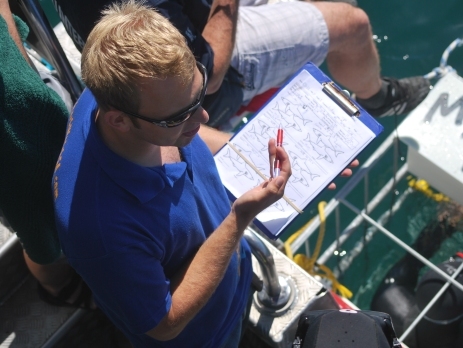 Data on Great Whites is difficult to collect, and as such knowledge of populations is merely estimates. It is believed that there are between 800 and 1000 Great White Sharks in this area, of a population of about 3000 – 5000 worldwide. It was estimated in the 1990s that there were about 2000 Great Whites in the region – meaning that the population has halved in the past two decades. Sharks are mainly in decline thanks to over-fishing. Sharks are largely caught for their valuable fins, often used in Asian countries in food and medicine. Tragically, sharks develop slowly and reproduce late in their lives. The rate of over-fishing is outpacing their rate of birth and development, meaning that there is a huge decrease in sharks which are being born and growing old enough to reproduce. What is being done to reverse this tragic trend? Penguins: Over the last 7 years, with each volunteer that has joined us on our shark volunteering project, we have made a donation towards creating penguin houses. These penguin houses are built to counteract the detrimental effects of the removal of guano – pengins can sleep, feed and reproduce in these houses in safety. The houses also protect eggs and chicks when the adult penguins need to leave them to go and hunt. The success of this project has been unprecedented, and penguins have often been using them just hours after their installation. In 2015, a rescue centre and sanctuary was founded to provide a haven for seabirds in distress. The centre means that injured and oiled birds can receive expert care, and includes a rehabilitation area, pool and laboratory so that the birds can recover as soon as possible. The centre is also used to care for penguin chicks who have been abandoned by their parents. In its first year of operation, the centre saved in excess of 120 penguins. 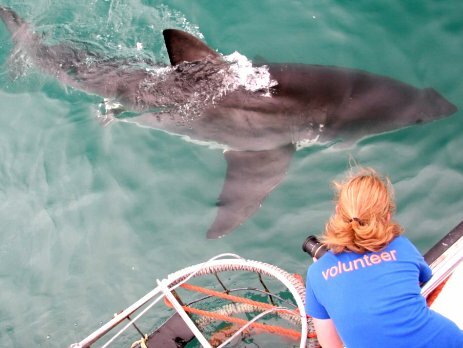 Sharks: To conserve and protect the shark population near to Gansbaai, scientists and conservationists are trying to gather more data to really understand the sharks’ movements and their response to their changing environment. Using acoustic tagging, marine biologists have been studying sharks’ interaction with their environment, habitat and prey. It also studies migratory patterns, allowing scientists to know where the main breeding grounds are, as well as to know where sharks are at the greatest risk. Other initiatives: Volunteers in South Africa are able to assist with the penguin and shark conservation tasks through our volunteer project. As part of this project, volunteers also help to collect and recycle discarded fishing lines, clean the beaches of any debris and where possible recycle this. Over 2000kg of marine rubbish has been collected and recycled to date with over 100 monthly clean ups. Volunteers also help with local community outreach programmes and educating local children of the importance of marine conservation.